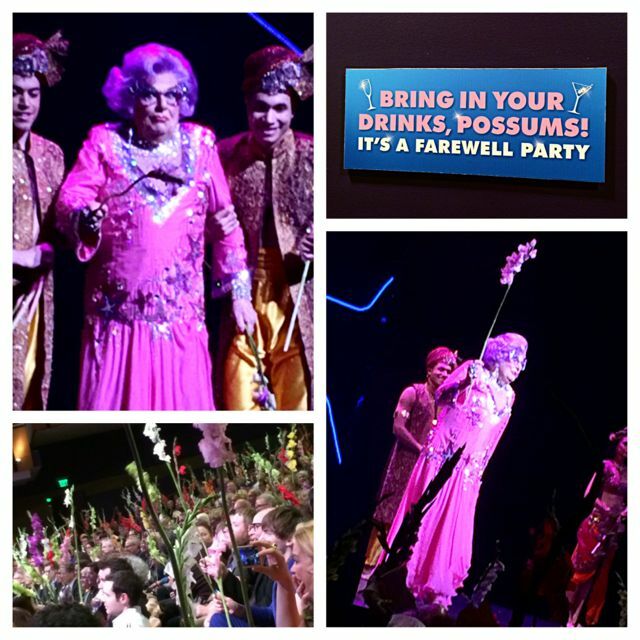 Dame Edna’s Glorious Goodbye at the Ahmanson Theatre: A Possum of a Good Time! 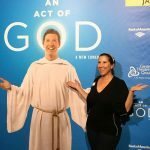 I have been going to the theater for almost four decades, yet I have never had the pleasure of catching one of Dame Edna’s shows. 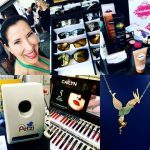 Well that all changed last week, when I was invited to Opening Night of Dame Edna’s Glorious Goodbye: The Farewell Tour at the Ahmanson Theatre in downtown Los Angeles and let me tell you, she was totally worth the wait! 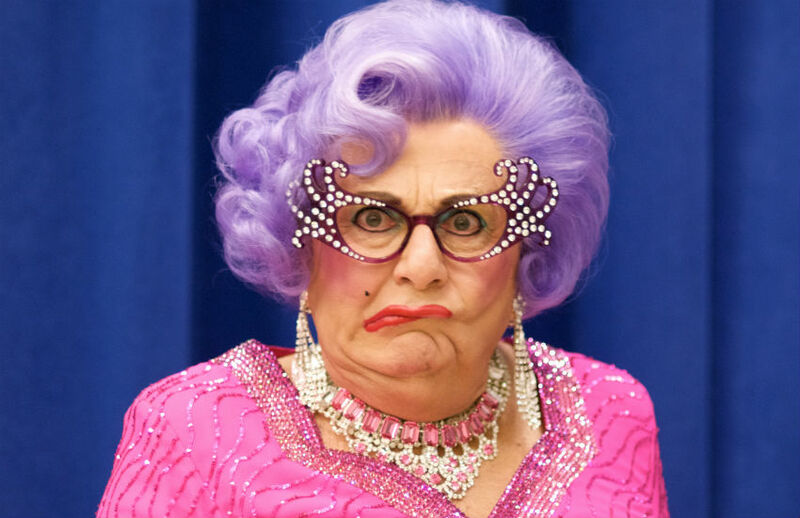 Dame Edna Everage, Barry Humphries’s brilliant, cheeky, irreverent over-the-top creation is my kind of gal. 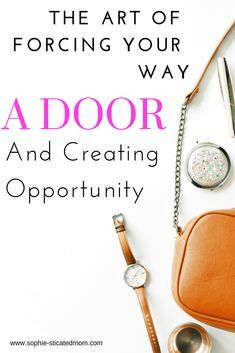 She dresses loud and bold, makes no apologies for who she is, says the types of things we all wish we could say but never do and she does it all with a sweet smile and a wink. When I saw this sign upon entering the theatre: “Bring in your drinks, Possums! It’s a Farewell Party!” which is typically a theatre no-no, I knew we were in for a good time! Barry Humphries has been portraying Dame Edna for 50 years (he himself is almost 80), and he’s still got game. The show is loosely scripted, incorporates a whole lotta improv, a bit of song and dance and alot of picking on the audience, but Edna does it all with grace, eloquent words and a smile. But don’t let her sweet demeanor, purple hair and pink frock fool you, she’s edgy and pushes the limits of what’s socially acceptable and the audience just laughs and plays along with her. Between picking on the seniors in the audience, to the ‘mizies’ (patrons in the balcony seats whose direction she promises to glance “in exact proportion to what you have paid”), to the ridiculous and insanely funny marriage between two audience members who don’t know each other, Dame Edna is Damn Good! 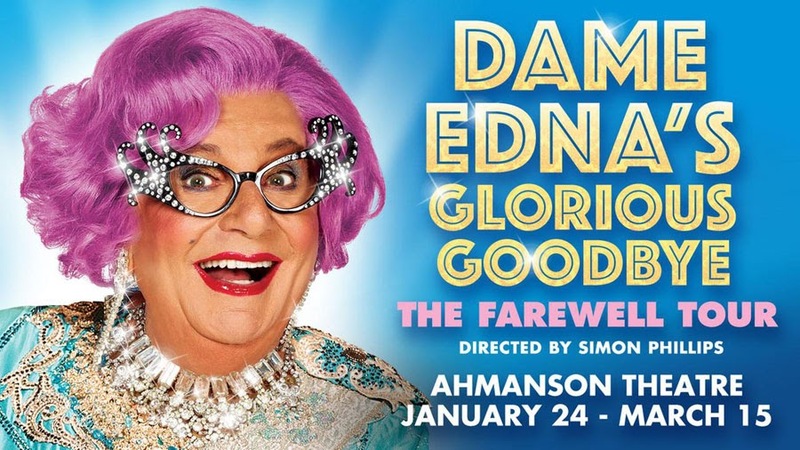 If you are looking for a fabulous fun night of theater, filled with laughter, insults and over the top style, Dame Edna is your girl! And this may very well be the last time you get the chance to see her stateside or anywhere, but then again with Dame Edna you just never know what to expect next. I've always wanted to see Dame Edna perform and last week I did! 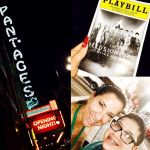 I attended her opening night show at the Ahmanson Theatre in DTLA and she was irreverent & FAB!